Total Eclipse of the Sun! 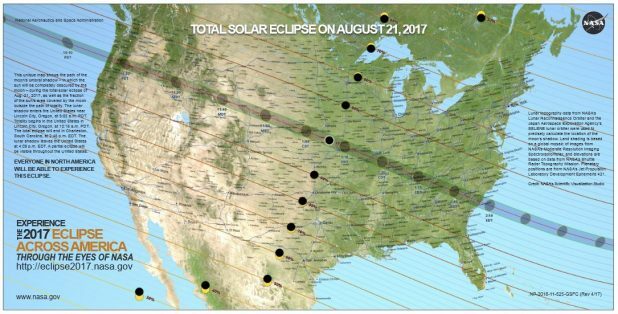 In North America on Monday 21st of August a total solar eclipse will be seen. Unfortunately the path comes nowhere near us but we can watch it on NASA’s website, without the worry about clouds or traffic jams. In Ireland we will be able to see a 5% blockage of the sun by the moon at 20.04pm. The moon will start obscuring the sun at 19.33, reach its apex at 20.44 and leave totally by 20.29. The NASA website shows many ways you can safely watch the event. The most important is NEVER LOOK DIRECTLY AT THE SUN. The damage to your eyes can be permanent!